Two Milwaukee pastors have filed a lawsuit against two Waukesha County Sheriff’s Office deputies and Waukesha County alleging systematic racial profiling. The lawsuit is the result of an experience the Rev. Demetrius Williams of Community Baptist Church of Greater Milwaukee and the Rev. John Patterson of Mt. Olive Baptist Church of Milwaukee had in May when they were returning to Milwaukee from one of their many fishing trips on the Rock River in Jefferson County. They were headed east on Interstate 94 in Waukesha County when the 18-foot boat trailer Patterson's Chevy Silverado was pulling got a flat tire. Deputies Erik Michaelsen and his training officer, Michael Powell, pulled over in their squad car. It's policy in Waukesha County to check on disabled vehicles. Patterson told Michaelsen they were waiting for a tow truck, according to the federal lawsuit filed Wednesday. Michaelsen then asked the two men if they had guns or drugs, according to the lawsuit. Williams and Patterson, who are African-American, repeatedly told Michaelsen they were pastors and waiting for a tow truck. But Williams and Patterson allege what they told the deputy didn't matter. Michaelsen proceeded to ask for both men’s driver's licenses, and then checked to see if they had warrants, according to the lawsuit. During the incident, Powell remained in the squad car's driver's seat while Michaelsen interacted with the pastors. Because Powell was Michaelsen's training officer, he was also named in the lawsuit that claims both deputies, who are white, knew they lacked reasonable suspicion to ask for the driver's licenses or run warrant checks. Patterson and Williams were profiled because of their race, like so many people of color, said Mark Thomsen an attorney with Gingras, Cates & Wachs, who is representing the pastors. "Until all of us, particularly those folks like me that are white, change their minds and change their practices and make sure that everyone is treated equally, this will continue. It is time for change," Thomsen said at a press conference Wednesday at Community Baptist Church of Greater Milwaukee. The Waukesha County Sheriff’s Department did not immediately return calls requesting comment. In August, the department released a statement from Sheriff Eric Severson saying racially biased policing is prohibited in the Waukesha County Sheriff’s Department. In the statement, Severson said the incident described by Patterson and Williams was investigated and "no evidence exists that actions taken by deputies were motivated by race." Williams has a doctorate in theology from Harvard Divinity School in Cambridge, Massachusetts. He has taught at Tulane University in New Orleans, Marquette University and is currently teaching religious studies and comparative literature at the University of Wisconsin-Milwaukee. Patterson has a master’s degree in religious studies from Trinity Evangelical Divinity University in Illinois. At the Wednesday press conference, Patterson and Williams said when they saw the deputies pull up behind them in May, they were relieved. "We were on the side of the road and they were doing construction and there was a number of trucks going by, it was a little unnerving," Williams said. "We looked and saw them approaching, and said, 'Look, we found some help.' That immediately changed once the interaction took place and they asked about guns and drugs." Patterson said he felt violated during and after the stop. Following the incident, Williams wrote a letter to the sheriff’s department asking for a meeting. Severson has still not met with the two men, Patterson and Williams said. "(Severson) was going to send his second in command and we don’t want that," Patterson said. "We want to talk to someone who can actually change policy. So we had no other recourse (but to file the lawsuit)." 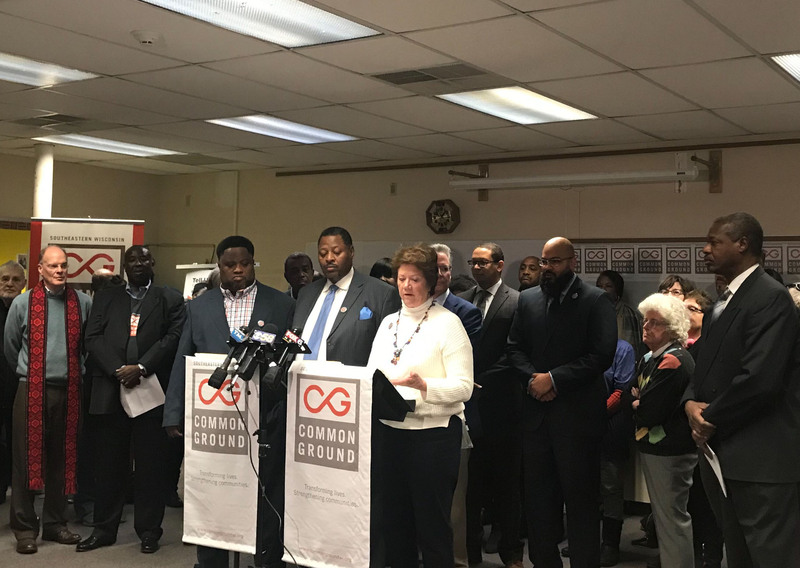 Common Ground, a social justice organization that represents 50 organizations in four southeastern Wisconsin counties, including Waukesha, also held a press conference Wednesday to support the lawsuit. "I want to thank you so much for being brave and courageous," said Sister Joanne Poehlman with Mount Mary University in Milwaukee. "It’s when we all feel violated that we will do something."